Your vehicle is much more than just a utilitarian. It signifies your status symbol & identity and is a luxury good to flaunt the personal style. Owning a car or motorcycle brings lot of maintenance work. Obviously, regular vehicle maintenance and care will improve life of the engine and helps in long run. India’s most trusted motorplace, Droom is everything and anything about automobiles. Coming your way are great offers under Droom Motor Care, providing multiple deals on automobile services. Get your mechanical baby ready for the heat waves swapping throughout the nation with extensive Car Care and Detailing service packages. This is car care and detailing service week going on. 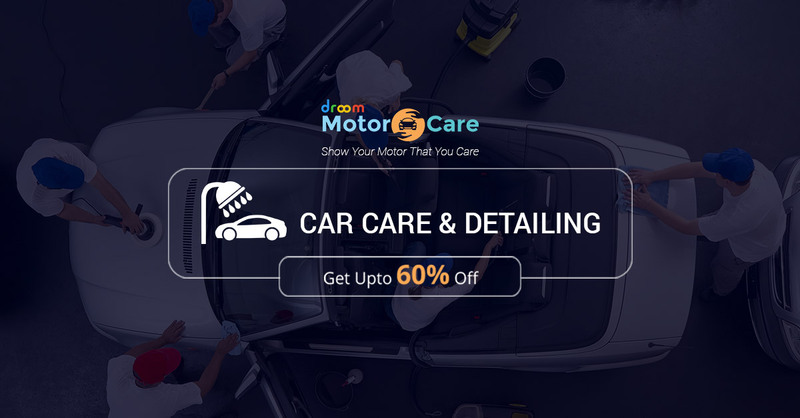 Take this opportunity to save up to 60% on car care and detailing services for your automobiles. Offer valid for limited time only. Get a deep cleaning for your car’s interior and exterior this summer and give it a showroom-like look. At droom.in you can find different services with smart savings. Get Roadside Assistance, Warranty, and Auto Inspection while saving up to 80%. Also, soon you can avail services and repairs from Droom, within your budget. Motor Care is perfect way to buy a comprehensive service for automobiles. Buy extensive services for bikes, cars, scooters, superbikes and more. What are you waiting for? Pamper your car or bike with an awesome service package. Hurry! Is the Automobile industry showing disruptive trends?